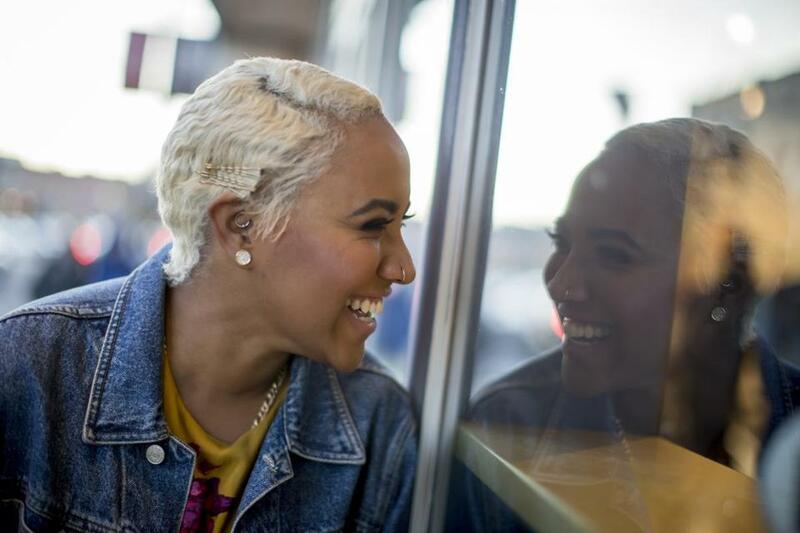 Shauna Barbosa grew up in Roxbury in a triple-decker with an African-American mother and a Cape Verdean father. Barbosa grew up in Roxbury and moved to LA to work at Buzzfeed 10 months ago. Her upbringing in a triple-decker with an African-American mother and a Cape Verdean father dances in and out of her vital, sensual “Cape Verdean Blues’’ (Pittsburgh), which was blurbed not only by Pulitzer-winning poet Gregory Pardlo but by Grammy-winning hip-hop artist Kendrick Lamar, whom Barbosa met while doing music journalism. Identity, womanhood, what it means to live and love in different languages swim through her poems. A series called “This Won’t Make Sense in English” is studded throughout the collection; Barbosa takes definitions from the first Cape Verdean Creole-English dictionary and does her own act of translation. The dictionary’s author, Manuel Da Luz Gonçalves, was in the audience that night, and Barbosa called him out for applause. Consequence Magazine, an annual literary magazine based out of Cohasset and concerning the consequences and culture of war, launches its 10th anniversary issue focusing on the work of women writing on war. The issue includes large moments and small and moves around the world: “If I knew the names/ of all those who died, I would write them here,” writes Danielle Jones-Pruett in “Elegies for Bodies Bending’’; Jill McDonough takes a student in her arms who’d shared his work on PTSD in her poem “But Yet’’; Laura Laing details being an Army wife to a woman deployed to Somalia in her essay “Your Leaving.” The work grapples with aftermath, in the large-scale sweep of history, in the daily efforts to live on afterward. The issue demonstrates the worth and wisdom of trying to put words to the unspeakable. As poet Marjorie Agosín writes, “stories survive in the absence of words.” In honor of the launch, Consequence will host a panel discussion on Wednesday, April 18, at 6 p.m. at the Boston Public Library. “Women’s Voices in War Narrative” will feature Alisa Sopova, Lauren Kay Halloran, Lee Sharkey, and Olivia Kate Cerrone. Brown University is celebrating the work of esteemed fiction writer and Brown professor Robert Coover with a three-day festival of readings and performances. “International Fiction Now,” running April 17-19 on the Brown campus, brings together Marlon James, Edwidge Danticat, Alexandra Kleeman, Siri Hustvedt, T.C. Boyle, Don DeLillo, Ben Marcus, and many others. Besides a number of readings, there’s a discussion on electronic writing and digital art, a performance of sections of Coover’s novel “Gerald’s Party,’’ and a late-night International Fiction Circus Now, to close things out. For more information and the complete schedule, visit brown.edu/cw/events.